BH5215A is an embedded serial to parallel controller. It has bidirectional RS232C channel and USB 2.0 channel. Both channels have 64 bit outputs, expandable up to 512 bits. The BH5215A can also works as RS232C / USB converter. The 64 bit output data are splitted into 16x 4 bits and stored in local memory or moved immediatelly to output. The local memory has tristate output. 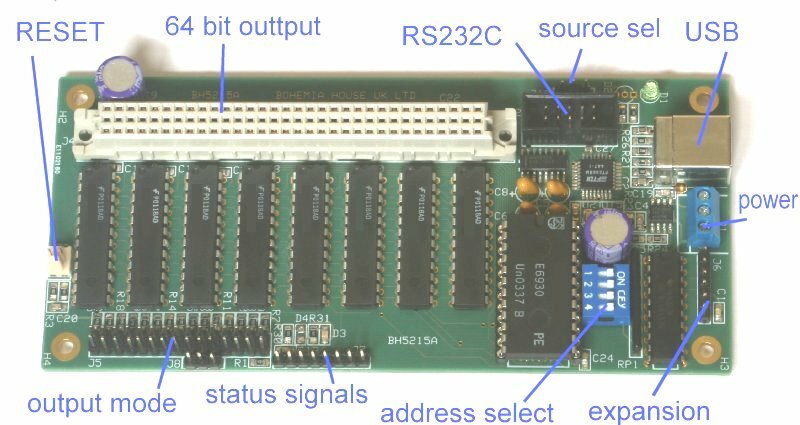 The 16 x 4 bits data can be multiplexed to 4-bit or 8-bit output bus. Maximal output current is 48 mA / each bit. The serial protocol is variable speed 8N1 from 2100 bps to 117 Kbps. The BH5215A recognizes the speed. The BH5215A has size of 145 x 67 mm and is powered from +5V power supply.